The living biochemical designs are made with ink infused with bacteria. From pizza to urine-based space plastic and even blood vessels, it seems there’s no limit to what can be 3D printed. A new 3D printing platform, created by ETH researchers led by Professor André Studart, head of the Laboratory for Complex Materials, is advancing the process by working with living materials. The specially designed material is actually an ink infused with bacteria. The machine is then able to print living biochemical designs for a wide variety of purposes, which vary depending on the bacteria used. Their research has been published in Science Advances. Composed of a biocompatible hydrogel, the ink provides structure for the bacteria (Pseudomonas putida and Acetobacter xylinum in this study, though other species could be used). This combination of hydrogel “ink” and bacteria relieves pain, retains moisture, and is incredibly stable. Given these attributes, one potential application for this particular ink could be as a treatment for burns. In a single use of the 3D printer, scientists can use up to four different inks, each containing multiple types of bacteria. 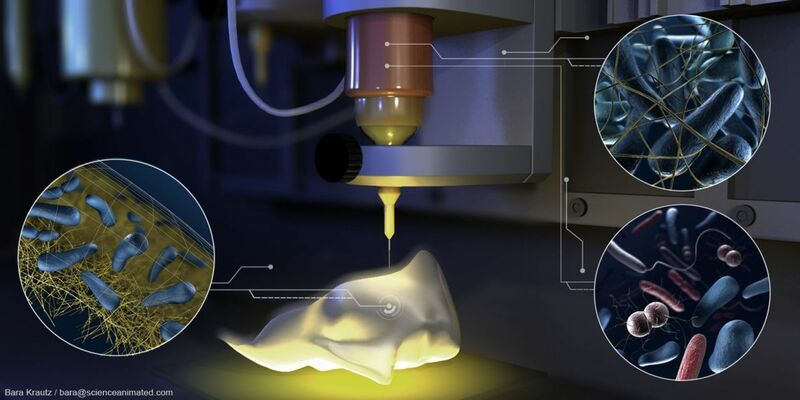 With living 3D printing, “The ink must be as viscous as toothpaste and have the consistency of Nivea hand cream,” according to Manuel Schaffner, a researcher and first author on the study. There’s still much work left to be done before this technology could be commercially viable, but the remarkable technique certainly has some interesting potential.Once the two major stumbling blocks for this technology — speed and scalability — are addressed, printing with living, bacterial ink could prove to be an integral part of many ventures. The most obvious applications would be found in medicine and biotechnology, but the technique could also be used to test drinking water for toxic components and even as a filter to help clean up oil spills.